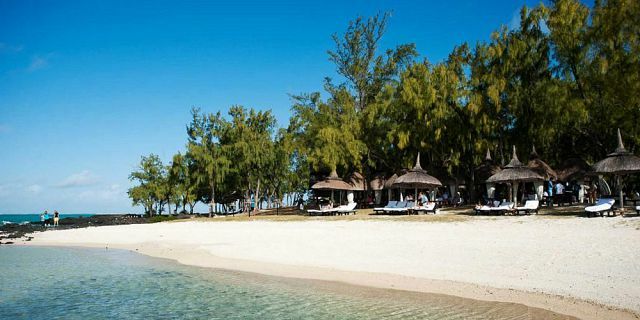 Enjoy a true once-in-a-lifetime experience at the Bubble Lodge located just off the East Coast of Mauritius on the small iconic island of Ile aux Cerfs, boasting of a private beach area. 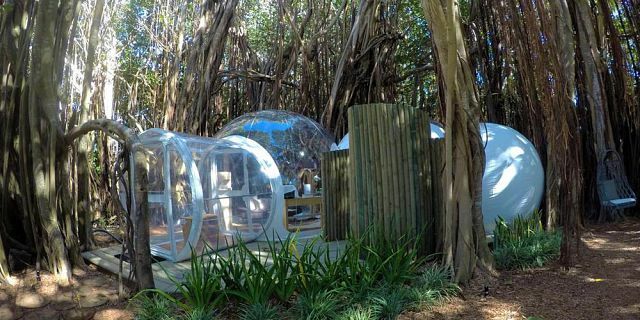 Perfect for nature lovers, the Bubble Lodge provides the comforts of a luxury hotel room but with the added element of a spectacular natural setting and utmost privacy. It is the ideal opportunity to try something completely different aside of usual hotel stays. Since the bubble is made out of crystal-clear glass you can fall asleep watching the stars at night and wake up in a dreamlike state the next morning, in an absolutely exotic location. 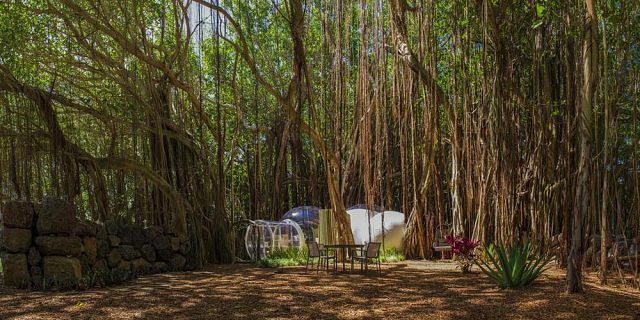 The lodges available on the Ile aux Cerfs island include two on the beach and one in a Banyan tree - rest assured they are spaced far apart from each other, so you can enjoy your stay comfortably, in all privacy. 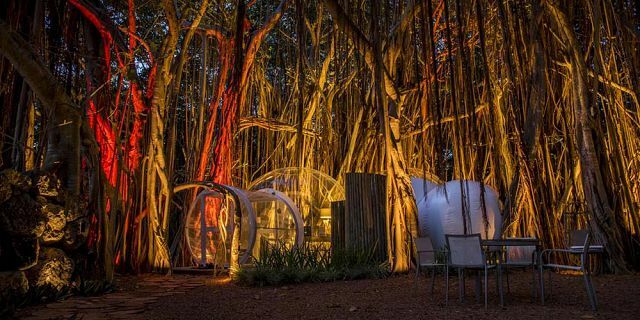 The Ile aux Cerfs Bubble Lodges offer you the incredible opportunity to spend one or two nights in an exotic place- an extraordinary experience out of the ordinary. 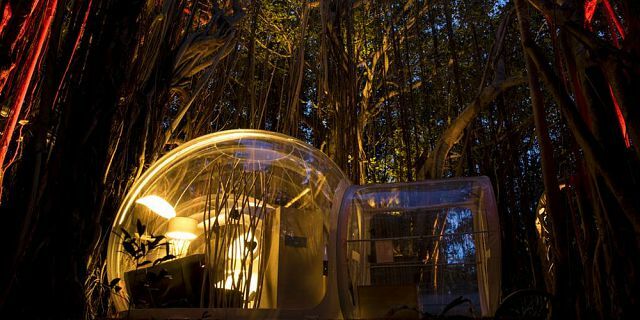 Designed to blend into their beautiful natural surroundings, the three lightweight Bubble Lodges have been built using minimal, recyclable materials and without harming the flora or fauna of the island. They result from an eco-design approach and are 100% recyclable, with the aim to offer a completely renewable eco-tourism device. 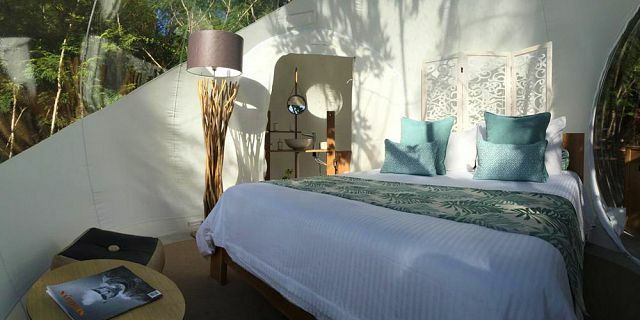 All the luxury bubble lodges are equipped with a spacious lounge area, a private bathroom (warm water shower facilities are outdoors) and sleeping quarters with a queen sized bed. They provide excellent surrounding views, with some overlooking the sea. They also boast of a tasteful décor and come with all essential amenities such as toiletries, tea and coffee making facilities, mineral water, board games, flashlight, sleeping masks (in case of full moon), a hairdryer, umbrellas and a phone. 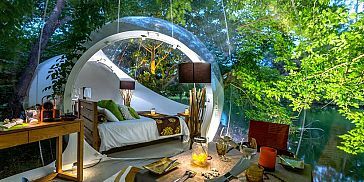 Situated in the midst of trees the bubble is very private and can easily be accessed through a winding pathway, well-lit at night. Gourmet 3-Course Dinner - Starter, Main Course (Fish, Chicken or Vegetarian), Dessert. Water included. Note: Alcohol, Soft Drinks and Lunch can be offered for an additional supplement. 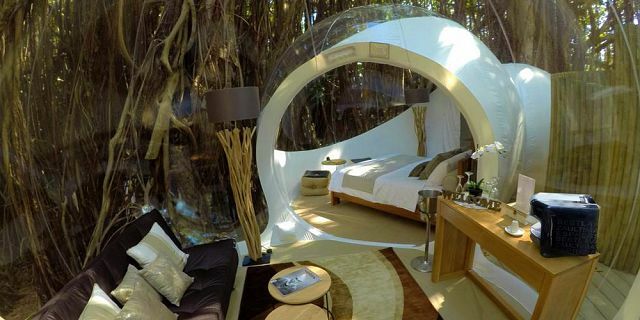 You can also enjoy several other services at the Bubble Lodge for a fee. 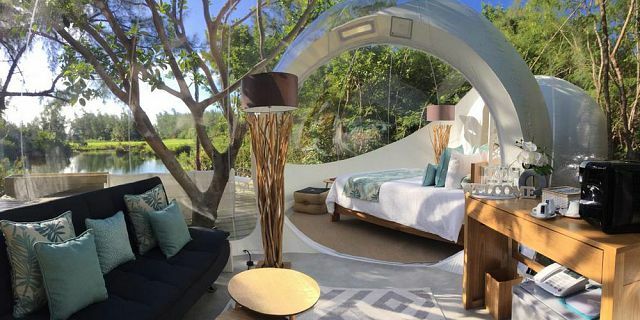 Whether you enjoy falling asleep to the sound of the ocean or while watching for shooting stars, the Bubble Lodge on Ile aux Cerfs will allow you to fully connect with the stunning surroundings of this tropical oasis. 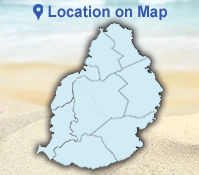 Located on the East coast of Mauritius, Île aux Cerfs is a small paradise island with preserved white, sandy beaches. 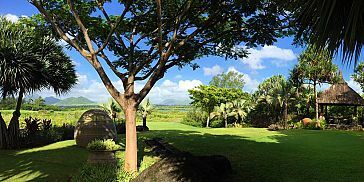 Île aux Cerfs offers extraordinary panoramic views that will take your breath away. Highly-prized by both Mauritians and tourists, Île aux Cerfs has some of the world’s most beautiful beaches and as such, it is one of the must visit places during your stay in Mauritius. Ile Aux Cerfs is a highly recommended location for snorkeling. The coral reef is beautiful and full of marine life. Together with the large black rocks that protrude into the water, it is an ideal place to snorkel and to enjoy the rich underwater world. Along with its beaches, Ile Aux Cerfs also offers a big selection of activities and facilities. 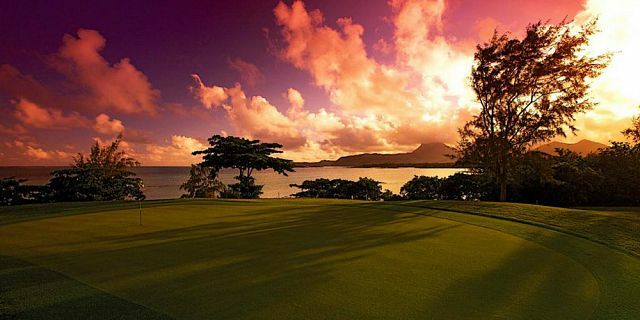 The Ile aux Cerfs Golf Club is a remarkable 18-hole Golf Course which earned a reputation as one of the best golf courses in the world. 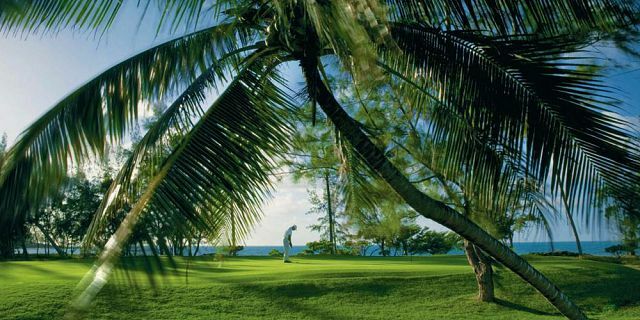 Fringed by white sands and surrounded by the blue Indian Ocean, the Ile aux Cerfs Golf Club features breathtaking views. The course covers 38 hectares and is the second longest course in Mauritius, with the holes snaking up and down the length of the island. On Ile Aux Cerfs you are sure to have a day of relaxation and fun on one of the picture-postcard beaches, whilst also enjoying a swim and snorkeling session in the lagoon. 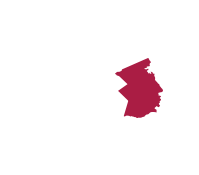 Alcohol, Soft Drinks and Lunch can be offered for an additional supplement. The prices below are for Low & High season. Please call us for Peak Season and Valentine's Bookings. Note: Prices are per night.